B”H Yesod Yosef distributed Shabbos assistance to 9 poor families. 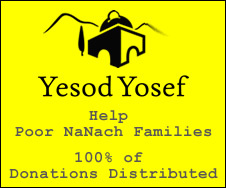 One loan was granted through the Yesod Yosef Loan Gemach. Donors were prayed for by the Kivarim of Binyamin HaTzadik, Rebbe Dosa ben Hurkanus and Binayahu ben Yehoyada. The Geula is in many ways the goal of everything that was done throughout the years and we see here that by giving Tzedaka we can bring it closer.